I’ve already reviewed the Mint Chocolate Tea, and now I have the honor of reviewing their Coconut Tea. As you can see from the images above, it’s a beautiful, beautiful thing. The smell alone makes this tea worth drinking – honestly, it smells like a wonderful, edible sort of suntan lotion or dessert. The taste won’t let you down either. 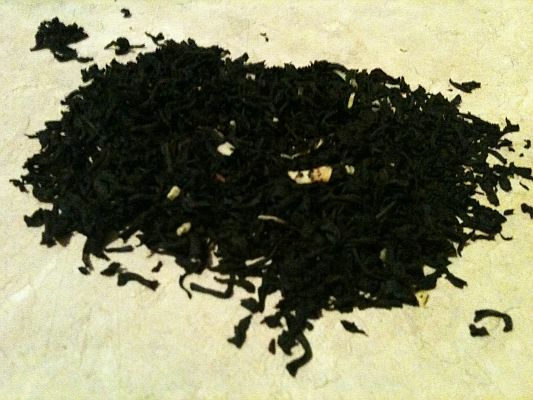 The coconut taste is noticeable, but you never forget that this is indeed a black tea. 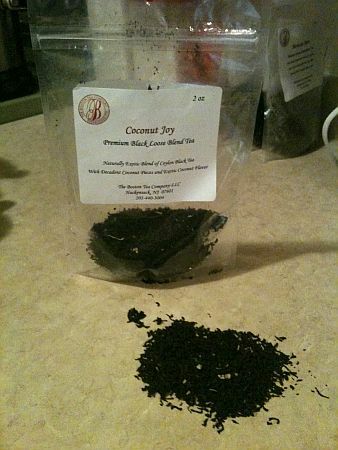 The ingredients are Ceylon Black Tea, pieces of coconut, and natural coconut flavorings. I use boiling water (or right about to boil), and I let the leaves steep for 4-6 minutes for the best flavor. 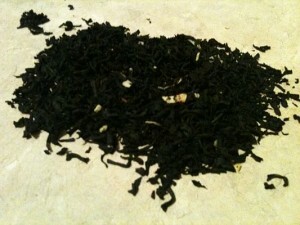 The leaves do infuse a very strong taste, so for a 8 oz. mug, I don’t use more than a teaspoon of the loose leaves.